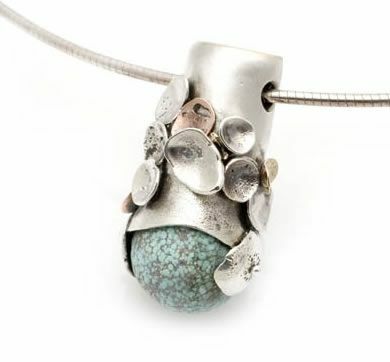 A large blue-green turquoise pebble is the centerpiece of this lovely piece. Encased in authentic silver and studded with both silver and copper accents, this pendant hangs on a long omega chain that measures 18 inches. I can adjust the length of the chain and slightly modify the pendant's design for you if you wish.